Accelerate digital transformation using Tableau and gain fast & accurate insights across your business. We can help you build strategy for using analytical insights to drive business actions. Our analytics experts support every phase of the analytics lifecycle from data to discovery to deployment. Uneecops offers dashboard as a service to SAP Business One customers which can help them gain an instant visibility into performances at the individual, departmental and enterprise level. Our experts use enterprise-class reporting, analysis, visualization, planning and forecasting capabilities to custom build dashboards that can improve organizational process and performance. Get dynamic reports, a personalized dashboard, 360-degree view of your business, and reveal key business trends in a limited yearly cost. Discover new insights at the speed of the thought. Our dashboards are ready for plugging with SAP business One data source. Drive faster decision making with a unique, 360-degree view of your business. 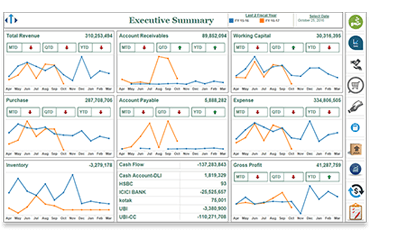 Understand your business at a glance with interactive dashboards. Use the filter panels to drill down to specific information and turn insights into actions for informed decision making. Gain an overall picture of the quarterly and yearly performance of your organization. The views include key financial measures such as net sales, net profit, and net profit margin. Whether you want to view any up-to-date financial information, record or reports the results are right at your fingertips. Identify promising leads faster, forecast results more accurately and get everyone on the same page. Empower your sales team to gain actionable insights from any device. Aid salesperson to interact with their customers better and close deals faster. Empower your teams to perform monthly complaint analysis and complaint priority analysis. Stay one step ahead of your peers by having personalized, rich and predictive insights relevant to your industry. Perform analysis of purchases on the basis of the month, supplier, user, product, category, warehouse and so on. Monitor and evaluate all your purchase activities. Be informed of your company’s cash flow. Monitor inventory levels across warehouses. Review how many units are bought per month versus how much stock you have on hand in a few clicks.